WOW! Those are some good-looking flowers downtown! This year, Main Street Marion performed a marvelous makeover of the Courthouse Square and surrounding downtown grid with voluptuous fresh flowers in hanging baskets and newly painted planters. This summer, the colorful blooms are luring the attention of the downtown community and those who pass through. The downtown beautification effort was all made possible mainly because of a partnership with the Community Foundation of Grant County, and some key helping hands from the City of Marion Parks Department. The downtown beautification effort took inspiration from the admired Gardens of Matter Park, which flourishes every year with bountiful blossoms. (Proven Winners, a revered brand of plants, earlier this year designated the Gardens as one of only seven signature gardens in the nation). The MSM Design Committee has created a sponsorship program to achieve this very goal. Main Street wants to serve the downtown community by providing this amenity, but the one-time grant of $11,000 from the Community Foundation is gratefully received, however short-lived. “We are setting aside some leftover funds from this year for the same process next year, but this amount doesn’t meet our budget in order to bring it back every year,” said Price. 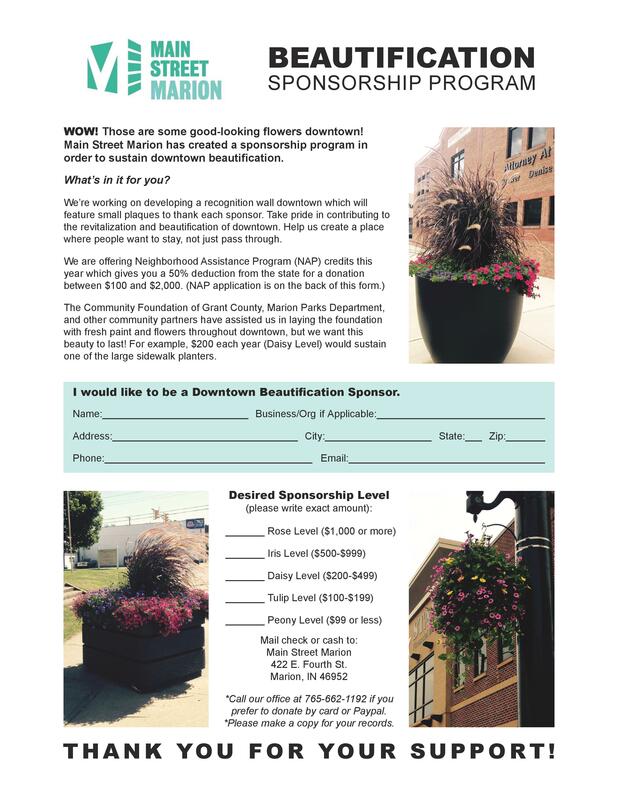 To become a sponsor, fill out and return the attached flyer, then mail or drop off your donation to Main Street Marion’s office at 422 E. Fourth Street, Marion, IN, 46952, with the memo: Downtown Beautification Sponsorship. *If you would like to receive a deduction on your state taxes equal to half of the amount of your contribution, please read and fill out the Neighborhood Assistance Program (NAP) form on the reverse side of the flyer. What do you get by being a sponsor? In addition to offering NAP credits as an option this year, we are in the planning stages of developing a recognition wall downtown with small plaques, thanking each donor. As a sponsor, you may also take pride in contributing to the revitalization and beautification of downtown! To promote and stimulate the downtown Marion economy through a four-point approach system – design, economic restructuring, organization, and promotions. Previous Join us for lunch any or every Thursday! Next Visit Marion’s Downtown Businesses to View Local Artwork!